As they say, if something is meant to happen, it will find its way to you. 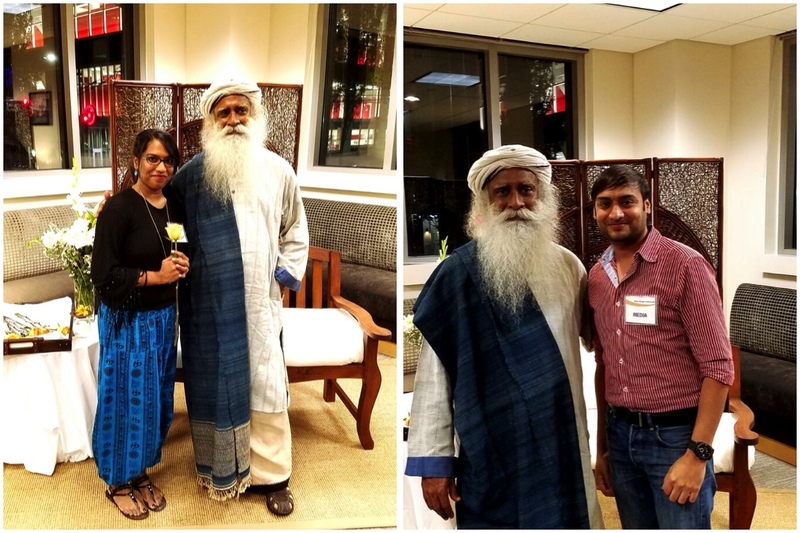 We were celebrating Phani’s birthday and Ananya was telling me about the ‘Meet, Mingle and Meditate’ event with Sadhguru ji and was worried that she might not be able to attend. As I expressed interest, she asked me if I would like to cover the event. 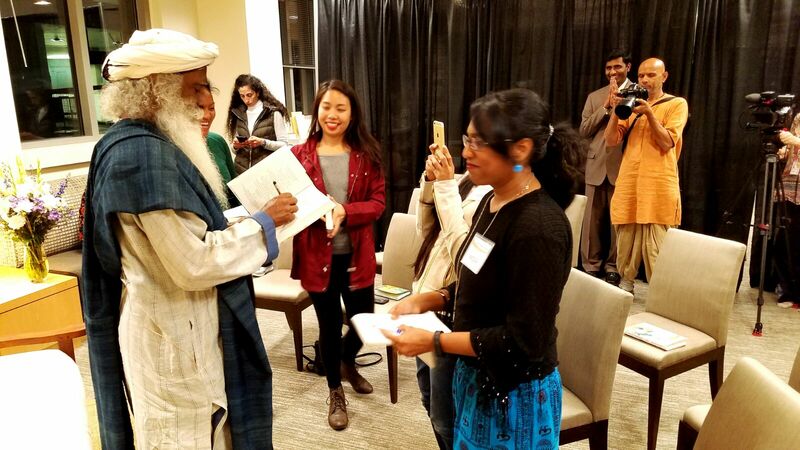 I instantly said yes and grabbed the opportunity to meet Sadhguru ji. I know I was just meant to be there!! It was a transformational evening to say the least. 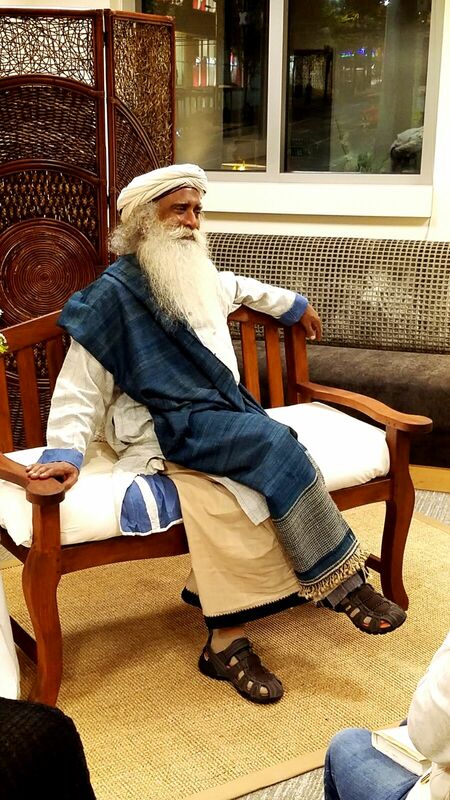 I see Sadhguru ji as a yogi, a mystic who is on a mission to help people realize the value of being joyful and experience the bliss of life. Now, where and how do I begin explaining about such an unbelievable experience. 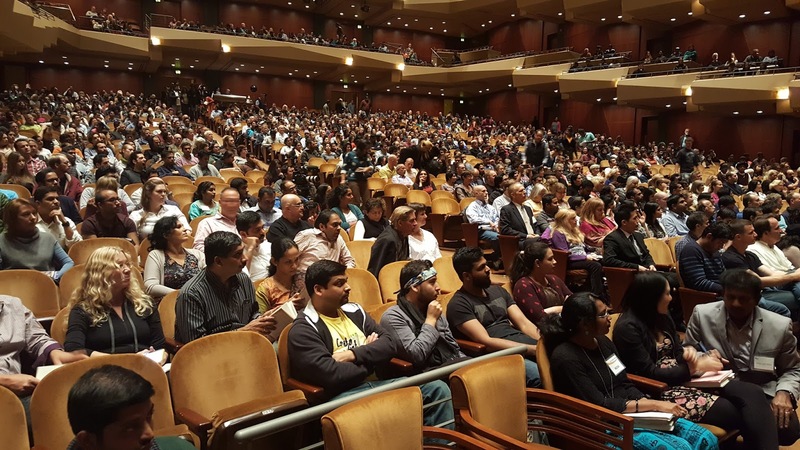 Phani and I were just in awe of what everything Sadhguru ji had to say. 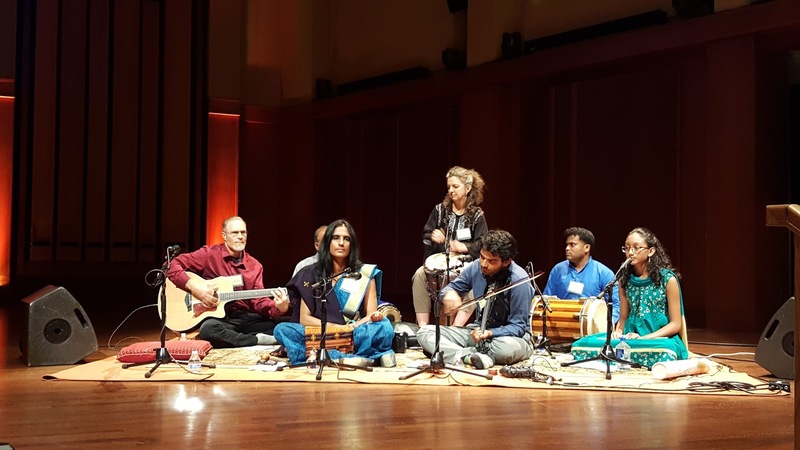 As soon as he stepped on stage, a sense of peace kicked in. I had countless epiphanies throughout his talk. 2 hours felt like 15 minutes and I was mesmerized by the end of it. There is no way I can put in words everything he said, as you just have to be in his presence and need to hear it yourself to understand what it all means. 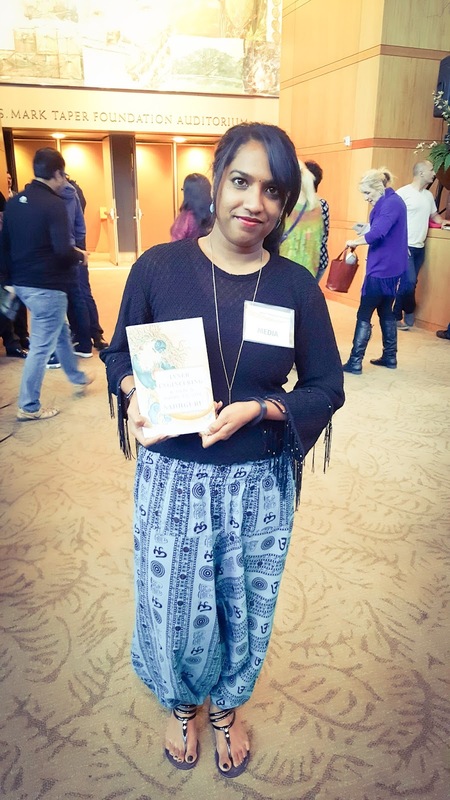 This is just a very humble write up of some of the things that really resonated with me. He said we don’t really need alcohol or drugs to get high, as he believes we should ALL be intoxicated on LIFE, I mean what better reason do you need, really. This is very personal to me as many of my friends tell me that I don’t need any of those, as I am always buzzed. He said you can dance, sing and laugh without a reason and just be JOYFUL because YOU ARE ALIVE and that is something to celebrate. He talked about how we are never satisfied with what we have achieved and asked when is it enough. He went ahead and asked would it be enough if we are made the King or Queen of this planet and said we would then want to be something more and so the quest is endless, which is the reason for so many people being unhappy these days. Though most of us lead luxurious lives, we are always worried about something not going our way. He said if everything happens as expected, it would be very boring. He compared it to a movie, saying we would only find a movie interesting when we are not able to predict the plot. Another aha! moment. He emphasized on how to live life to the fullest and enjoy every single moment. He asked why did such a simple thing become so complex. Thought provoking indeed. He says we should be joyful on our own and not by someone or something, as he considers that to be slavery. So true if you think about it. He talked about how we think we are all leading stressful lives. He said that was because we just don’t know how to handle our mind. This is where the tools come in play. His book, ‘Inner Engineering, a Yogi’s guide to Joy’ helps with just that. He said, don’t have fear of failure as everyone shall PASS (hahaha, like we all die [pass], no matter what). So why not PASS joyfully. So true right. His talks were sprinkled with such wit and analogies that makes it very easy to understand. At the end of the event, Sadhguru ji had us meditate for 5-10 minutes and it was absolutely wonderful. 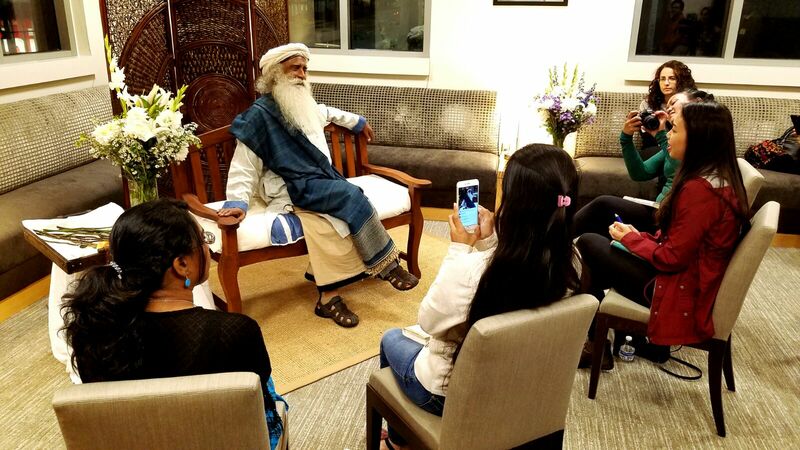 And then we got to attend the press meet where we so fortunate to interview Sadhguru ji in an intimate setting. This will definitely be an evening I will cherish my entire life as it has changed a part of me for the better. I am usually a very happy person but like everyone, I have my moments where I am disappointed or annoyed or felt something other than joyful. I always gave an excuse saying, I am human, after all. 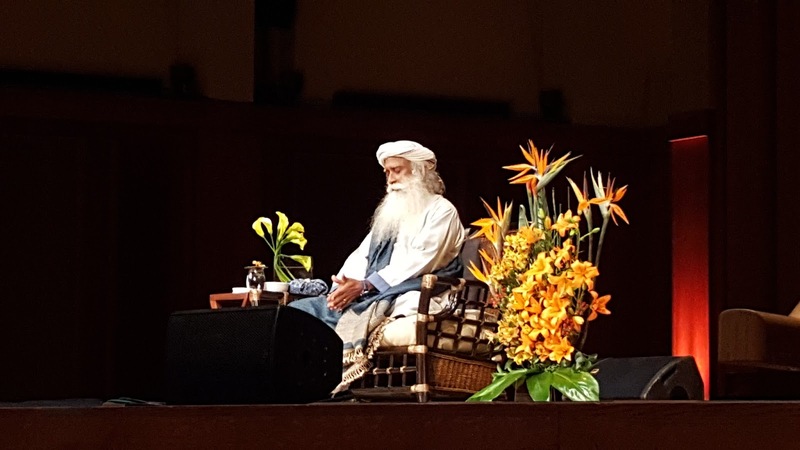 An evening with Sadhguru ji helped me realize that the fundamental requirement of life is to be joyful and not anything else. This experience reminds me of not to give into those evils and how to always be joyful. Just saying, I might have found my new motto: ALWAYS STAY HIGH, ON LIFE. The student went to the chocolate factory. As he walked through, He saw the one chocolate wrapped nicely, he instantly liked it but he wondered that he may find much bigger one further. So, He walked further, then he saw another chocolate. But again, he thought the same. When he started to reach near the end of the factory, he couldn’t see any chocolates as big as the one he didn’t pick earlier and started to regret his decision of letting it go.